Zoingo Boingo is the fantastic flexible freestyle pogo from Flair PLC that can be used on both pavement and grass. It lets you bounce higher, further and wilder! It features a rugged stretchable cord that attaches the handle to the durable high bounce ball. 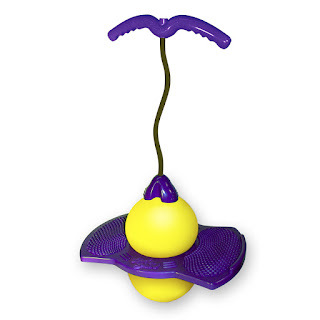 The cord and bounce ball work together to produce high energy bounces and great control. 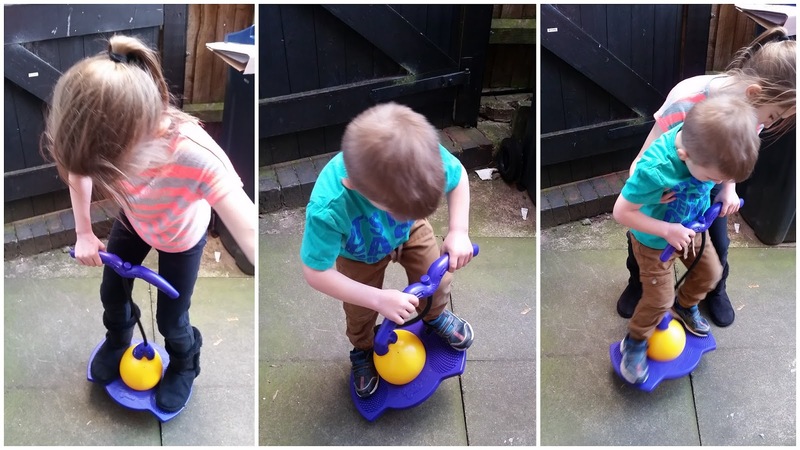 This new and very clever pogo ball will take you to a whole level of new heights! It's so much fun! It's recommended for children aged 8 and over which means I'm old enough to have a go too. I used to have a pogo ball similar when I was little but it didn't have the cord or handle and I loved it. I remember having great fun bouncing around for hours on end in my garden. Now that the weather is getting warmer, my youngest two are outside nearly every day after school. They love being outside, just like I did when I was their age. If they're not bouncing on the trampoline, they're swinging on the swing or playing hide & seek in their play house. This week my youngest two have been playing with the Zoingo Boingo and although they haven't quite mastered it just yet, they've had great fun trying. I even had a go when they wasn't looking and have to say, I'm a pro! It's just like I remembered, bouncing is fun! The Zoingo Boingo is perfect for garden fun. It's kept my two entertained for hours and bouncing is a great way to encourage some good old fashioned healthy fun. Sometimes I wish they'd play outside more often (not just so I can have some peace and quiet) but because there's a whole new world of fun to be had out there. My childhood consisted of 80% outdoor play. Playing hide and seek, British bulldog or Akkie (kind of like tag). So if you're looking for a simple yet fun outdoors toy, this could be it. The Zoingo Boingo is easy to inflate, we used a bicycle bump to inflate ours and it didn't take more than 10 minutes. Once inflated everything is pretty simple to use. There's a nice ridge on one of the foot plates to help you get on which I think is a great idea - it really helped me. Once on, you squeeze your feet against the ball in the middle for added support or at least that's what we've been doing and bounce. If you hold the cord up as high as you can, it helps for support and makes your bounces higher. It's a simple toy but great fun all the same. My youngest two (aged 5 and 8) have been having great fun trying to master it and although they can't quite manage to do it all by themselves just yet. They won't be giving up any time soon. There's been no accidents to report so far. Luckily the ball is low to the ground so even if they were to come of it, they are low enough to the ground to put their feet down. We're happy to give the Zoingo Boingo a Bounce-Tastic 4/5.